Body conditioning. It is painful and time consuming, yet it is essential for reaching high levels in martial arts. The upper extremities are used for striking, blocking, sensing, grabbing, breaking, lifting, etc. The list goes on, but don't forget that they are also vulnerable to all of the above. Body conditioning. It is painful and time consuming, yet it is essential for reaching high levels in martial arts. The upper extremities are used for striking, blocking, sensing, grabbing, breaking, lifting, etc. The list goes on, but don't forget that they are also vulnerable to all of the above. From a Chin Na point of view, when you're attempting to lock and obtain control, if your strength is matched, then you better have the joint flexibility to escape and counter-lock. From a bare-hand point of view, think of all the points of contact that you have to deliver a strike. There are that many chances to break a bone. The faster you can extend and pull back your arms, the faster you can block and strike at will. This requires fast-twitch muscle training. In addition to possessing speed that is unmatched, you must have strength, and power. With the right training you can have both. Not only do you want to have a strong grip, but whether you are grabbing a weapon or a wrist to Chin Na, you must be swift. You only have a split-second window of opportunity to grab an opponent's wrist, their leg, shirt, or whatever the situation calls for. So practice opening and closing your hands to train your wrist and hand muscles. Fully extend the fingers and fully close them to get the most out of this exercise. See how many repetitions you can do in 30 seconds and try to build up. To have that bone-crushing grip, you can start off by gripping anything from a tennis ball to grippers that are made specifically for hand strength. 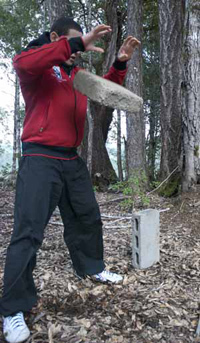 Another exercise that is challenging is cinder block tossing. 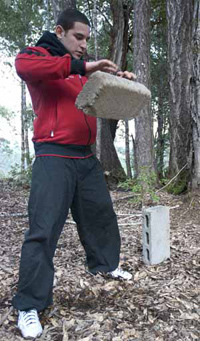 The cinder block can be hollow or filled, and you can practice with one hand or two hands. You can flip it forwards and backwards, and if you have a partner you can do all these things back and forth to each other. First, count how many times you can fully extend and bring back your punches within 30 seconds or even a minute. Do only what you are capable of, while gradually pushing past your fatigue threshold. When you feel ready add weights in your hands. Start off with one pound in each hand, and slowly work up to five pounds. Punch for 30 seconds or for one minute. You will find that your punching speed without weights will increase, and the longer that you can extend your time, the longer you will be able to execute lightning-fast strikes. The Pushup is arguably the best upper body exercise. One of the best things about pushups is that there are so many variations. You want to be able to do a full pushup with proper technique, first and foremost. If you have to build up by doing them on your knees or by leaning against the wall, do it. You will build the habits and discipline to eventually perform variations, like knuckle, clapping, one-handed, and even finger-tip pushups, from all five fingers down to one finger. Arm strength and endurance are qualities that are essential for wielding weapons. They are your foundation and you should always strive to improve by adding more weight or more reps. Increase your strength-training time. If you can only wield a staff, saber, or sword for two minutes, push to a five minute goal within the next few months. Let's clarify what kind of strength is needed for weapons training. Building big bulky muscles is not what we are looking for. We want to build strength and endurance within our ligaments and tendons, and one of the most overlooked qualities that you can train is elasticity. They need to expand and contract in a split second without tearing or pulling a joint of out of place. Weapons conditioning is one of the best ways to practice basics, because while you are drilling important exercises, you can be holding a steel sword or a steel staff. Overtime you will feel dramatic difference when training with your regular-weight weapon. These exercises will give a beginning practitioner a great foundation for any martial art practice. Even a skilled practitioner can apply the theories explained above to improve on their current routine. Knuckles, wrist, elbows, shoulders; these are your tools you take into the battlefield, so keep them in tip-top shape. Without proper conditioning, your bones, muscles, joints and connective tissues are all at risk. The exercises in this section are not the only ones for a given body part. Use these and always look to add more to stimulate your joints and muscles from all kinds of angles. Remember that this is not a quick process. Your knuckles need time to build up their tolerance; your wrists ligaments need time to build up their flexibility and strength. Only perform what you are capable of, and you will steer clear of injury and slowly build your conditioning.